Cosy cottage, recently renovated, divided into two spaciuos parts, each with private garden of 400 m2. Under conservation act. A large fenced garden surrounds this house and the owners house which lay nearby. Swimming pool with outdoor hot water shower. View of the sunflowers fields, typical of the tuscan landcape. Sunset over the famous Gargonza castle. Private gate. Video entry phone for each apartments. The interiors are well kept, have terracotta and parquet floorings, beamed ceilings, stone archways, bedrooms had ceiling fan. Wrought iron beds. Siena 50 km. Florence 60 km. Rome is approx 2 hours by car. Cosy working farm "this property", renovated in 2004. 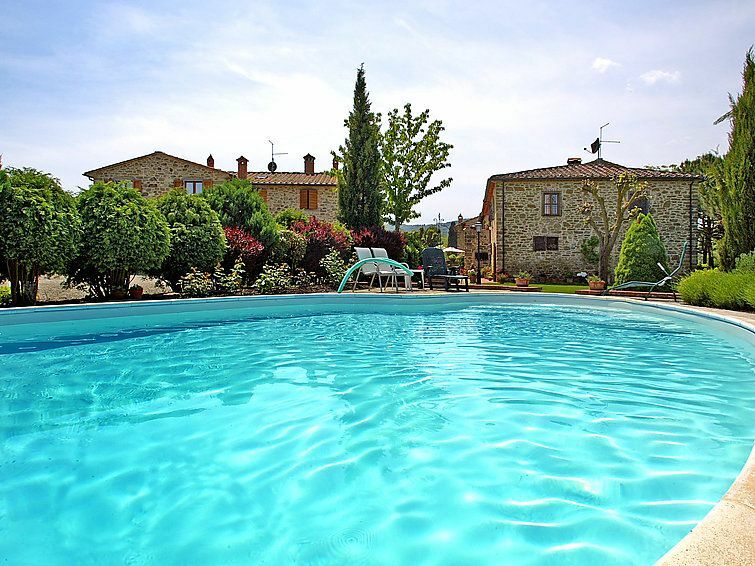 5 km from the centre of Monte San Savino, 19 km from the centre of Arezzo, 30 km from the centre of Terme di Rapolano, in the countryside. For shared use: swimming pool (11 x 5 m, depth 100 - 175 cm, 30.04.-15.10.) with salt-electrolysis pool-cleaning system. Unconventional pool shape. Outdoor shower, table tennis, boccia. Private: garden 400 m2 (fenced). Garden furniture. In the complex: WiFi, table football, heating to be paid on the spot (01.11.-15.04. ), heating available only from 01.11. to 15.04.. Available: bicycles (4). Parking at the house. Shop 5 km, restaurant 5 km, café 5 km, railway station "Monte San Savino" 5 km. Riding stable 10 km. Please note: car recommended. Suitable for families, suitable for seniors. The owner lives on the same property. The complex has another 1 house for rent. 3-room semi-detached house 130 m2 on 2 levels, on the ground floor. Renovated, comfortable and tasteful furnishings: large living room with open-hearth fireplace and satellite TV. Kitchen (4 hot plates, oven, dishwasher, microwave, electric coffee machine) with dining table. Shower/bidet/WC. Upper floor: 2 double bedrooms. Bath/bidet/WC. Small terrace, garden 400 m2. Terrace furniture, barbecue. Beautiful panoramic view of the countryside. Facilities: washing machine, mosquito net. Internet (WiFi, free). Maximum 1 small pet/ dog allowed. There is a utility room with sink on the ground floor. The house is equipped with a cleaning system with a central filter.